After you have decided upon a size, the next thing to consider is the type of wood you would like for the body. 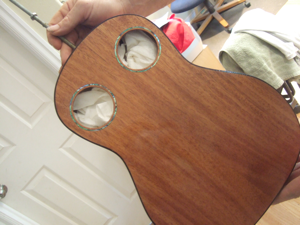 All Koa - top, back and sides. 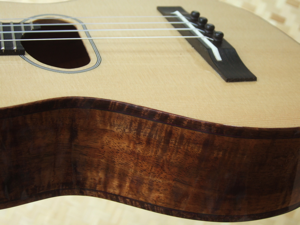 The most traditional 'ukulele wood, Koa is a good sounding and very beautiful choice. This is especially true because you will have access to really nice curly Koa that I have set aside. 3A+ to 4A grade wood is standard on my instruments and occasionally I can even offer Presentation Grade for a reasonable upcharge. I use only air dried Koa from Hawai'i Island, my home. All Mango, again very traditional but not as commonly used. I use Mango, also from this Island, Hilo side, the most colorful and occasionally, very curly. I think a little more mellow than all Koa. 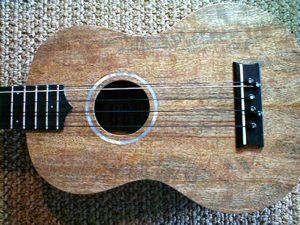 All Mahogany, the wood used on nearly all the old Martin and Gibson `Ukulele. I use only genuine Honduran or Cuban Mahogany. Cuban is a little harder and much more uncommon in instrument grade. These are both "true" mahoganies, belonging to genus Swietenia, unlike so called African Mahogany. 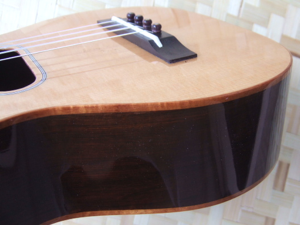 Mahogany is not flashy looking, but it is very beautiful, with a strong even tone and plenty of volume. 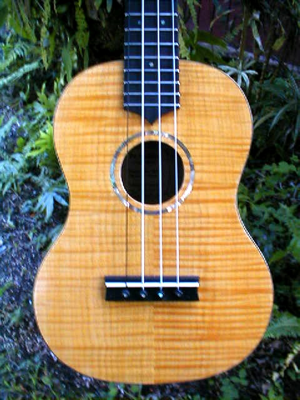 Less traditional, but very appropriate for some playing styles are `ukulele with spruce, cedar or sinker redwood tops. These may be paired with any number of wood choices for the back and side. 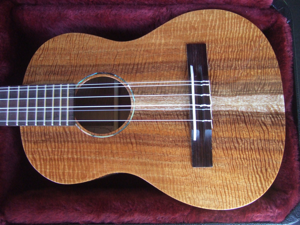 Rosewood is an excellent back and side wood for Jazz and modern fingerstyle `ukulele. Koa, Maple, and Mahogany also work great. It depends upon your preference and the sound you are looking for. I have an excellent selection of these tonewoods, as well as really wonderful top material in Sitka, Engelmann, Lutz and European Spruce as well as Western Red Cedar and Sinker Redwood. Sinker Rdwood is 100+ yr. old wood reclaimed from river bottoms.I am very fond of this rare wood, it has great tone with a striking dark color. I am more than happy to explain the visual and acoustic properties if you have questions about particular wood choices. Of course there are many other possibilities. Some unlikely choices make great instruments. 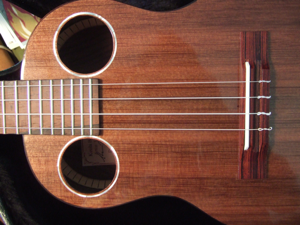 Here is an all maple `ukulele that sounds fantastic.